Why Choose DUI CLASS ONLINE AZ For Your Online DUI Classes? 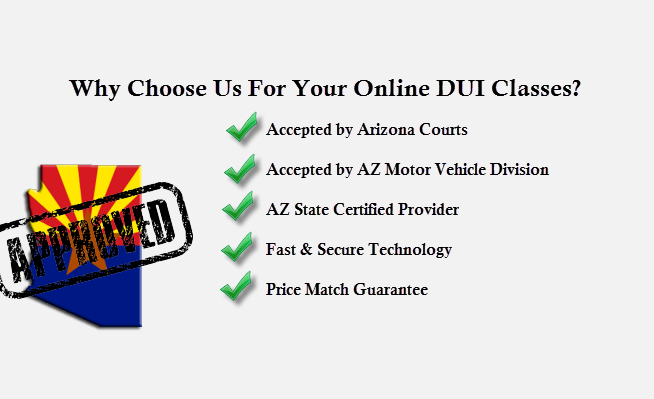 As an Arizona State Certified Online DUI Provider, all of our DUI courses are in full compliance with the Arizona Court systems and the Arizona MVD! We’re a fully certified DUI Agency through the Arizona Department of Health Services. That means that any DUI Class or DUI Screening you take with us will be accepted by the Arizona Motor Vehicle Division and all Arizona Courts. Regardless of where you received your DUI in Arizona, we can help make your DUI process seamless and efficient. We have served people throughout the entire state of Arizona including those who received DUI’s in Phoenix, Scottsdale, Mesa, Tucson, Tempe, Chandler, Glendale, Peoria, Surprise, Goodyear, Avondale, Cave Creek, Carefree, Ahwatukee, Fountain Hills, Flagstaff, and Casa Grande. Enjoy the convenience of quick access to complete your Online DUI Class right away! As an Arizona State Certified DUI Agency, all of our Online DUI Classes are fully compliant with the Arizona courts and the Arizona Department of Transportation, Motor Vehicle Division (MVD). You’ll love our safe, secure, and confidential platform combined with free customer service when and if you need it! Take your DUI Class anytime and anywhere, 24 hours a day and 7 days a week! Simply choose your class from the drop down menu below, register, and begin. It’s that simple. Regardless of the time or day, you’ll be able to login to your DUI class from anywhere that you have an internet access. It’s fun, simple, and hassle free! We know you have a busy life. Getting your life back on track as quickly as possible is your #1 aim. Our online platform will put you back in the driver’s seat in no time at all. Our “go at your own pace” DUI course keeps track of your progress and allows you to login and logout of your DUI class as needed. Сasino en ligne gratuit machine a sous.You maintain control and complete your course work in alignment with your schedule, not ours! We’ll ensure you pass your class! All of our tests and quizzes can be retaken so there is no need for you to stress about not passing your class! We’re on your team, and our qualified and locally-based staff is available to assist you. © 2016 Stonewall Institute. All rights reserved. Legal Disclaimer & Privacy Policies.